Southern Himalayas, India, Burma, Africa, America. The seeds and leaves, which contain different constituents, are the main parts used. The undemanding, fast-growing Neem tree thrives in hot tropical climates. The tree, which reaches a height of 12 metres, is covered by a pale grey bark, beneath which is a reddish wood. The ash-like leaves can reach a length of up to 50 cm and form an airy, spreading foliage. Clusters of purple flowers, which adorn the tree from February to April, exude a lilac-like scent. These develop into cherry-sized, golden-yellow stone fruits with woody, many-sided kernels. It is claimed that the Neem tree works true wonders and will soon be able to heal all human ills. What it really does, still has to be investigated. However, it has already been proven that it has numerous microcidal and anti-inflammatory properties and enhances the immune system. For example, Neem leaf extracts have been shown to be effective against 14 types of fungus (including Candida) and many bacteria (e.g. the gangrene bacterium Staphylococcus aureus and the typhoid pathogen Salmonella typhosa). It has also been shown to prevent viral infections such as smallpox, chickenpox, hepatitis B and herpes. All parts of the Neem tree are used in Ayurvedic medicine, where the tree is valued for its cooling, forming and drying properties. 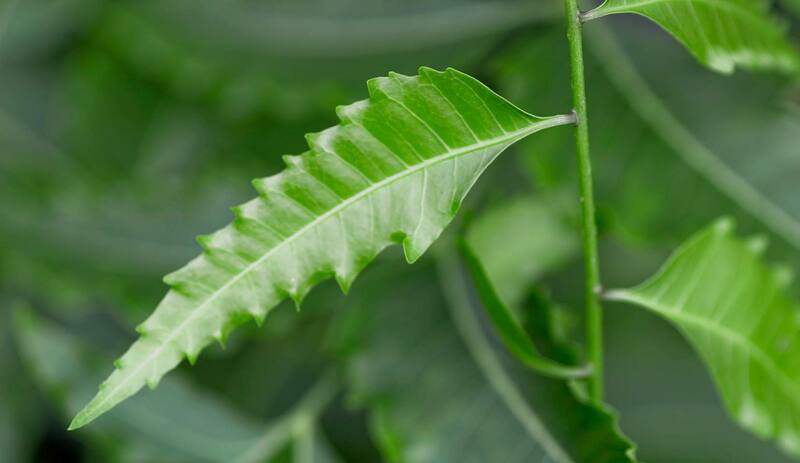 Neem leaves are often used for daily care of the skin, hair, nails, gums and teeth. Extracts of Neem leaves also have a wide range of therapeutic uses because of their mild antiseptic and strengthening action. For example, they are used in states of weakness and excessive nerve-sense processes such as hair loss, dandruff, head lice, fungal infections of the nails, chronic periodontitis and eczema and for excessive metabolic processes such as blemished skin, acne, nailbed inflammation and poorly healing wounds. The substance azadirachtin extracted from the seeds is used as an eco-friendly natural pesticide. The Miliaceae family includes tropical tree species such as mahogany. In India the Neem tree is believed to be the home of one of the oldest Indian deities: the goddess Sîtalâ, who appears in mythology as healer of smallpox. It was therefore customary to plant the tree next to temples and in front of dwelling houses to protect against disease. Its branches are used for New Year rites and spring cures. When a child is born people use them to decorate their huts and dwellings so that they will be blessed with divine help. In order to make up for disturbing Sîtalâ and taking away part of her home, sacrificial offerings are placed in front of the tree to pacify the goddess before the branches are broken off. Today the shade-giving Neem tree is still planted on avenues and fields because it freshens the air and keeps away insects. Because of its numerous different effects, Neem is sometimes referred to in India as "The Village Pharmacy". Neem twigs are also used there as tooth brushes. The young twigs are chewed until they are frayed and then used for brushing the teeth. developer of a Neem-based insecticide, was granted a patent on the Neem tree which was then withdrawn again by the European Patent Office on 10 May 2000. More than half a million Indians had taken to the streets in Bangalore to protest against the patent and the attempt to take away their rights to the holy Neem tree. In the Neem tree the roles of the elements warmth, air, water and earth are very evenly balanced. None of them appears to predominate. Thus, as medicinal plant, Neem generally harmonises the organism and regulates both overactive nervous processes and excessive metabolic processes in the skin and its associated organs. Neem leaves have been used by WALA ever since Elisabeth Sigmund, the founder of Dr.Hauschka Skin Care, brought back this medicinally valuable tree from a study visit to India. Extracts of the leaves are contained in Dr.Hauschka Rose Deodorant, Eye Balm, Liquid Eyeliner, Clarifying Day Oil, Neem Hair Oil, Revitalising Hair and Scalp Tonic, Neem Nail and Cuticle Oil, Brow & Lash Gel, Volume Mascara and Defining Mascara and in Dr.Hauschka Med Fortifying Mint Toothpaste. In hair care Neem leaves are valued because of their fortifying action on the scalp.